Just like many web services, you can create personalized login account on Youtube website. This allows you to use extended features like tracking uploads, favorites and subscription. Youtube account login is also required to view mature or flagged videos. 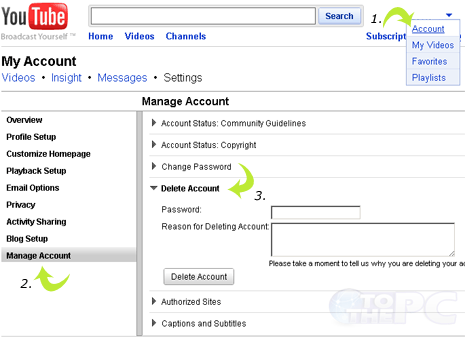 However, if for some reason you want to remove Youtube account – following is the quick procedure. 1. Goto Youtube.com & login into your account. Hover over username next to down arrow & click on ‘Account’ option. 2. Then click ‘Manage Account’ option on the left options menu. 3. Click Delete Account option. Enter your account password & reason for deletion of Youtube account. Click ‘Delete Account’ button and its all done.